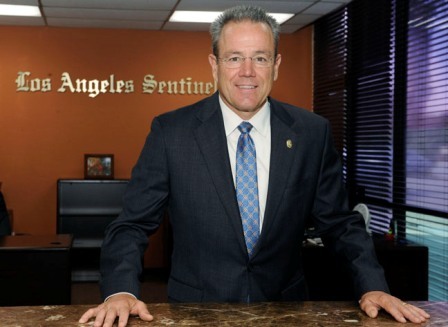 This month, the Los Angeles Sentinel and the L.A. Watts Times had the opportunity to conduct a sit-down interview with Los Angeles Police Department chief, Michel Moore regarding his new position and the departmental goals he hopes to accomplish during his tenure. Moore grew up in a poor family as one of five children. Throughout his childhood, he moved across the United States and eventually they moved back to his state of birth California. Growing up Moore had a passion for helping others and found that to be meaningful, however, law enforcement wasn’t yet on his radar. “When I was growing up in the South, my objective was to become a certified public accountant. So I was going to go to business school, a big difference. When I came out [to California] though as I started going to school for that business degree, I found myself drawn to something more than just a nine-to-five job,” said Moore. Moore chose to pursue law enforcement for many reasons. For one, he was looking for career stability. Secondly, he wanted to hold a position that was well respected. Lastly, he wanted to be a part of change while at the same time be challenged. As a man of faith, Moore believes that everyone is here for a purpose and he is living out his purpose through his profession. Today, Moore steps into his new position having 37 years of law enforcement under his belt. With Moore’s appointment as police chief, came new department openings. With that being said, Moore appointed deputy chief Robert Arcos to assistant chief. Arcos is not new to the Los Angeles community. He was one of three finalists competing for the assistant chief position. With Arcos’ appointment came a new opening for deputy chief. Moore appointed Regina Scott who will oversee operations with the downtown core, East LA, northeastern part, Rampart area of Los Angeles. Scott, who the Sentinel ran an article on last week (July 19), is the first Black female to be promoted to LAPD deputy chief. Moore went on to say that he announced deputy chief Robert “Bob” Green as his new chief of staff, Phillip Tingirides, deputy chief from South Bureau will be moved to transit services and Dennis Kato will be a deputy chief on the west side. He also promoted a new commander, Jeff Nolte, and he will be Kato’s partner. Additionally, Moore has promoted other individuals including captain Beverly Lewis who was appointed to commander to serve in the San Fernando Valley as the number two person there, Gerald Woodyard, who will oversee the community engagement group, and captain Darnell Davenport who is the patrol captain for the southwest area. “Beverly Lewis is a resident of Los Angeles and an African American women who I found to be very capable and a great leader. She’s a great mom as well but that move is going to allow us to I think to demonstrate to the people that we’re serving that we are reflective of all of our communities,” said Moore. Moore also mentioned that the LAPD will be releasing a community survey that was completed in April and May of 2018 at the Board of Police Commissioners. Next, Moore discussed implementing diversity within the police department. How does Moore plan to accomplish this? Through the job design and the department’s recruitment efforts. “We need to assure that as we are recruiting women to the positions that what constitutes qualifications that if we see something that is having an adverse impact or a despaired impact on women that we look at what that function is or what is that requirement; is it truly needed,” said Moore. According to Moore, in 2017, the department hired 550 people but only 51 of them were African American. “We need to get better at [hiring more African Americans] and one of the tasks I have for my team is working with the mayor’s office and office of innovation on what we can do, and how we can engage to attract qualified applicants that will allow us to build that diversity,” he said. Historically, the relationship between LAPD and the Black community has been strained for decades, dating back to the beating of Rodney King, the 1965 Watts Rebellion and many other historic events that took place. Given some of the more recent brutal beatings of Black women and men both locally and nationally, some African Americans believe the police department has a long way to go before putting a dent in the issues at hand. We asked, chief Moore what his plans are to bridge the gap between the community and the police department? The first step is encouraging more Black men and women to apply and join the Los Angeles Police Department. “With that, how are we insuring that as we engage all of our communities that we’re acting, that we’re seeking- that they know the door is open, that they’ll find an employer a profession that needs their service, that would benefit from their insights and their abilities but also it’s going to be one that’s going to be very rewarding to them,” said Moore. The second step is increasing the department’s community engagement. “Are we in the churches that we should be, are we in community settings, are we in the town halls, are we in the opportunities with Coffee With A Cop or impromptu meetings that allow people to understand that we’re not just engaging but we’re welcoming and in need and asking for more applicants from the African American community to take a step forward? Be part of the change that this department is going through,” he said. Aside from implementing these aspects to bridging the gap, the importance of accountability within the police department is another pertinent issue which Moore is well aware of. Moore also stated that he plans to hold communities accountable. “What I mean by accountability for the public is that that accountability is in determining whether or not I’m being fair is that people look at all the facts and circumstances as they’re known and not rely upon a word of mouth or a rumor about what someone else represents as what occurred,” he said. The current temperature of South Los Angeles shows that many community members feel as though they are being harassed and not protected or served. 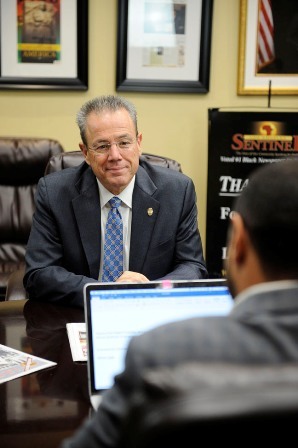 Moore spoke with the Sentinel about what he plans to do within the department to combat that. 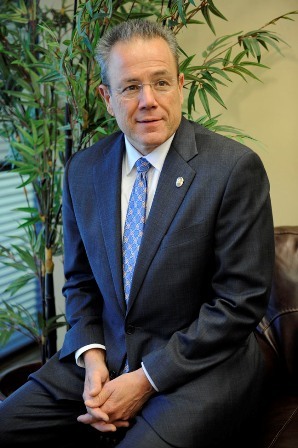 Currently, there are two major initiatives Moore plans to use. “I’m identifying 200 additional personnel that work currently in specialized positions to bring them back out to geographic areas so that staffing in areas can be bolstered so officers have more time to have that Coffee With A Cop, to have that time in a church pew, to have that encounter in a town hall or just a community meeting and not feel that they have to shorten those interactions because there’s an emergency or there’s a call that needs their response down the street,” he said. The next part of the initiative is improving the department’s technology. Moore was appointed as chief of police on June 4, by Los Angeles Mayor Eric Garcetti. During his tenure, he pledged to be visible, responsive, and accessible and ultimately build a “deeper trust in the community” by proving to them that he will be fair and hold officers accountable. “This is an exciting time for me and my family and I intend to enjoy this by taking on this challenge head on and again. For the public knowing who Mike Moore is I hope to wear it on my sleeve. I love this city and it’s important to me that the people of Los Angeles believe in their police department, that they support them. We don’t always get it right and when we mess up we gotta own it and I intend to be a chief that communicates that but at the same time when we get it right that people will also support us and I think that’s the fair contract if you will, a social contract between all of us,” he said. For more information on the department’s operations or to volunteer with LAPD please visit, www.lapdonline.org. Kimberlee Buck contributed to this report.